'Three electronic bands', it says on the flyer. Well, someone seems to have forgotten to inform Misnomer, who are in full-on guitar mode as they crowd themselves onto the absurdly small performance space (Madame Jojo's doesn't have a stage, it has a shelf). The guitars don't come as a surprise to me, because I've seen Misnomer before and I know what they're like...or do I? Last time I caught Misnomer live, they were doing a kind of rumbustious indie thing, half way between Chumbawamba and Sonic Youth. Now, they've....gone AOR. Yes, really. They've junked all the indie-isms, and replaced them with a big, extravagant, FM-radio sound, while the singer seems to have freshly graduated from the Bonnie Tyler Academy Of Power Ballad Belters. She bellows out the vocals with the force of a small hurricane, while hurling herself around the stage in a frenzy of hip shakin', headbangin' stadium-rock moves. It's almost as if she's fronting an entirely different band inside her head: her full-on rock-chickisms are oddly in contrast with the reserved, don't-mind-us-we're-just-the-backing-musicians demeanour of the rest of the band, and what's more her moves don't necessarily fit the music. When the band take things down a bit, and ease into some slower songs, the singer's still bounding around up front at 100mph. She's forever throwing shapes, blonde mane a-tumble, as if she's got Jim Steinman's finest moments playing on a concealed iPod. The Misnomer fan club, clustered at the front, greet all this with grins and cheers, but I'm hanging back, slightly stunned by the spectacle. It's a relief when Misnomer's guitarist steps up for a vocal: her air of cool detachment instantly puts us in an entirely different place. 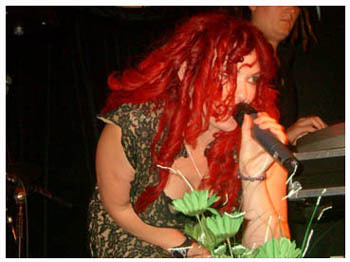 But then the lead singer's back, and once more we're in Drivetime Diva territory. She belts out the vocals with such hyper-manic intensity it's almost surreal. She's like Bette Midler on benzedrine - and I'm heading to the bar. I've got to get away from the band in case they launch into a cover of 'The Wind Beneath My Wings'. Well, after Misnomer's full-throttle attempt to storm the playlists of adult rock radio, I could do with a little light and shade. I need a band with a certain cool confidence, a band that doesn't feel the urge to slam the trying-too-hard control up to max. Fortunately, the next band happens to be Swarf, who should fit the bill admirably. Now, every time I review Swarf I always find myself pointing out that they're a band with immense potential for real success - if only they'd move away from the goth zone. Well, I see from tonight's flyer that Swarf are indeed attempting to make just such a move. At any rate, the blurb describes the band as 'trance/trip-hop/breakbeat/electronica', a rather haphazard collection of references which does rather create the impression that the Swarf are randomly throwing generic terms at the wall in the vague hope that one of them might stick. But hey, at least they didn't mention the G-word. 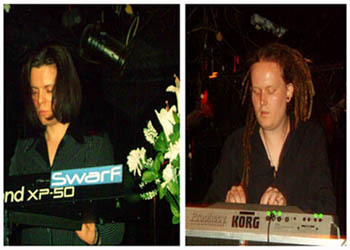 Paradoxically, having gone to the trouble of de-gothing the band description, Swarf seem to have made up for it by putting together an on-stage image which is distinctly...gothic. It's not so much electronix-controllers Andrew and Chris in their none-more-black garb that does it, nor even vocalist Liz's elegantly noirish dress. It's more the way the stage is tricked out with sober arrangements of white flowers, like a window display at a funeral parlour. Couple this with the fact that the boys spend the entire gig gazing sombrely down at the gear in their flight cases, like a couple of embalmers sizing up the night's work, and Swarf's entire set-up looks like party time in the laying-out room. Frankly, If Swarf genuinely want to represent themselves as something more than the goth scene's favourite electro act, I reckon they need to sack the stylist. Or, at the very least, lose the floral tributes. The set starts slowly, almost hesitantly, as if Swarf are cautiously feeling their way into the performance. Maybe that's because the band's notoriously crash-happy laptop disgraced itself again in the soundcheck earlier on; maybe it's because they're opening up with some unfamiliar new songs. I have no idea if the new stuff represents any kind of new direction for Swarf, but my first impression is that they've pushed things a mile or so along the introspective, trancey, downbeat road. Then again, maybe that's just the way it sounds tonight. The crowd is subdued, uncertain, waiting for Swarf to stomp on the 'uplifting' pedal and get their groove on. It doesn't quite happen, however, until the band finish with the newbies and get stuck in to the old faves. 'Subtext' is an immediate firestarter. The crowd starts moving like a many-headed monster, and Liz grins and sparkles as if she's just located her mojo. 'Drown' is introduced, as ever, with a swift straw poll of the audience, to decide who likes beer and who favours vodka - a bizarrely cheery way of bringing in a song which, for all its uptempo lightness, is actually a cautionary tale of alcoholism. The crowd don't mind, though, and the dancefloor becomes positively frenzied as the song builds to that relentless climax. But the set is short: that's our lot. Swarf say brief farewells and are gone. I'm left feeling suitably uplifted, as always after a dose of the Swarf medicine, albeit not quite as high this time as usual. The band seemed to be firing on only three cylinders tonight, and while any Swarf gig is a good gig, this one won't quite go down in history as a classic. 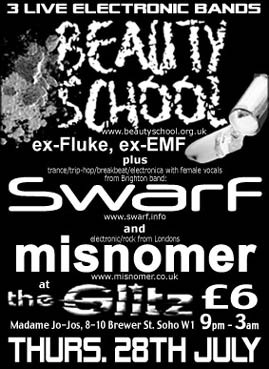 There's another band to follow - Beauty School, a new outfit featuring, apparently, an ex-member of EMF. I'm not sure that being ex-EMF is any kind of selling point in the twenty-first century, but I fear we will be unable to check 'em out tonight. Time is a-pressing; last trains beckon. Heading for Waterloo station, I reflect that this was one of the more bizarre gigs I've attended in my 25 years or so in the moshpit. 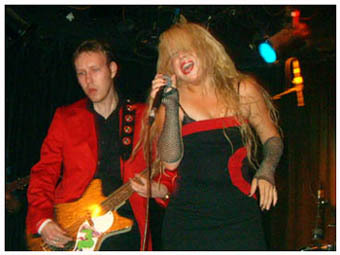 A manic AOR diva and the funky funeral directors - who would've expected that?